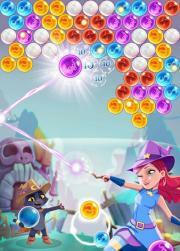 Users play as a friendly witch character named Stella. The witch aims and shoots colored bubbles upwards at other bubbles, clearing them whenever she connects three or more bubbles of the same color. Stella attempts to free owls trapped in these bubbles, clear paths for ghosts to fly upwards to their friends, and defeat an evil cat named Wilbur.